I predicted a dozen ripoff versions of Rush Hour for 2013. Well, here's another one. I think it's the second one. The Voxel Agents have updated their puzzle app Puzzle Retreat: https://play.google.com/store/apps/details?id=thevoxelagents.puzzleretreat Puzzle Retreat is out on Google Play with 50 puzzles to solve for free! I've recently been playing NineOut again. 3 things: my new high score of 217,000 was not recorded on the Leaderboard because my wifi was turned off. I am now in 4th place. The 3rd place person looks like he's 15 years old. Another blow to my ego - a kid is ahead of me. The first place person has a score of something like 440,000. More than double my score. 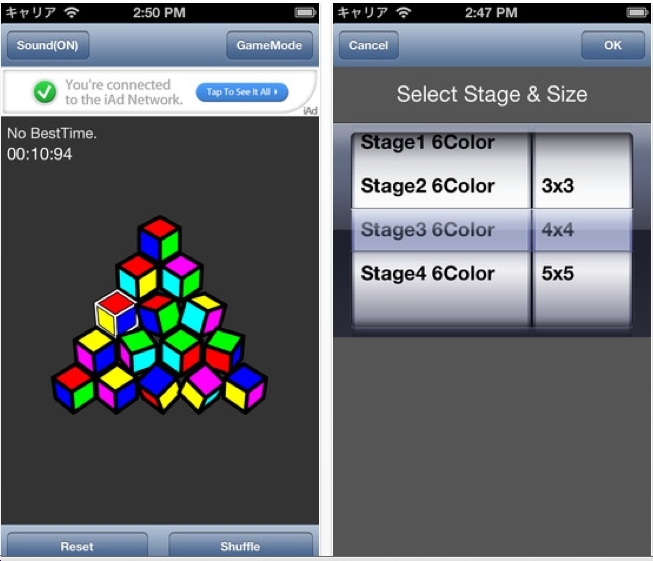 Tom Chen recently contactec me about his puzzle game app: Nonogram Style Lite. The concept is not new. There are 60 free levels, and I've done them all. I like the mechanics of this game. 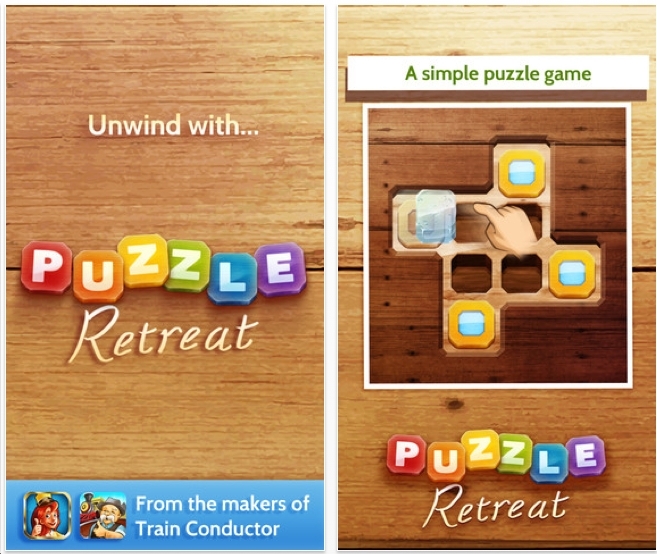 It's not one of the best puzzle apps of 2013, but it's worthy of your time. The object of Just Routes is to draw 1 continuous line that never intersects itself. Naturally, you must start at 1 and finish at the highest number. 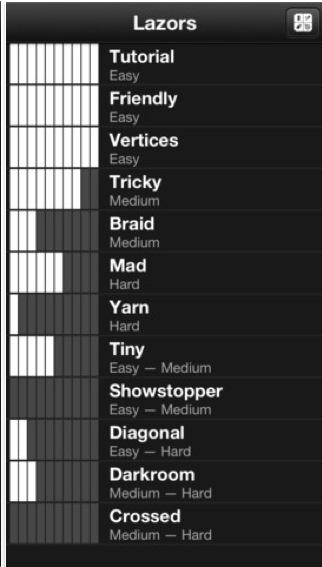 There are 45 easy levels, 35 medium levels and 25 advanced. I've done them all. I really like this set of puzzles. 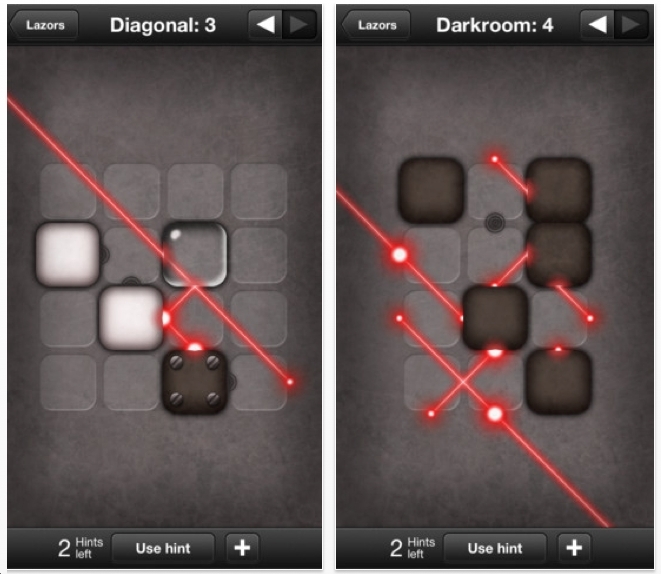 I'm not sure if the puzzle designer Oleg Gorshunov intended this: your path need not cross over every square. What I really like is that it's easy to erase your moves. 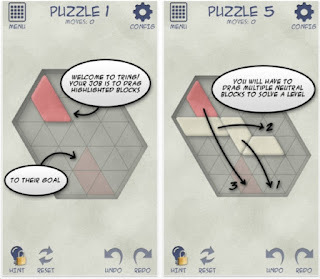 Another puzzle game app that I think is better is Numeric Paranoia. 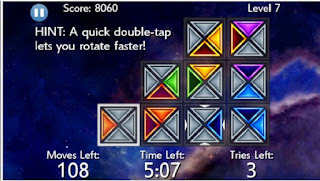 Same concept except many more puzzle levels and more difficult. But once you make a mistake, you must start over again. 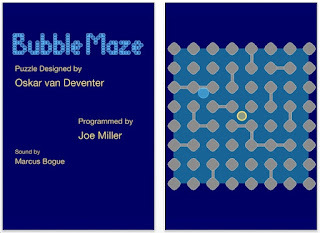 Bubble Maze was designed by my Dutch friend Oskar van Deventer. The object is to tilt your device so that the blue bubble will eventually land on the yellow dot. Joe Miller did the programming work. 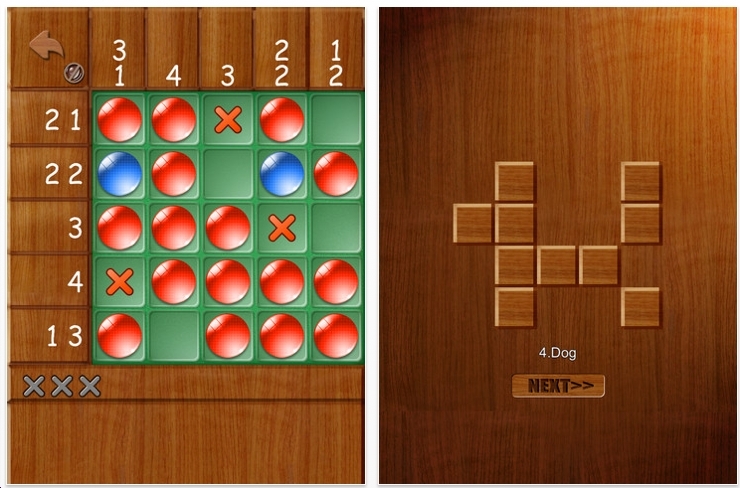 This puzzle game app has only 1 level, but it's free. 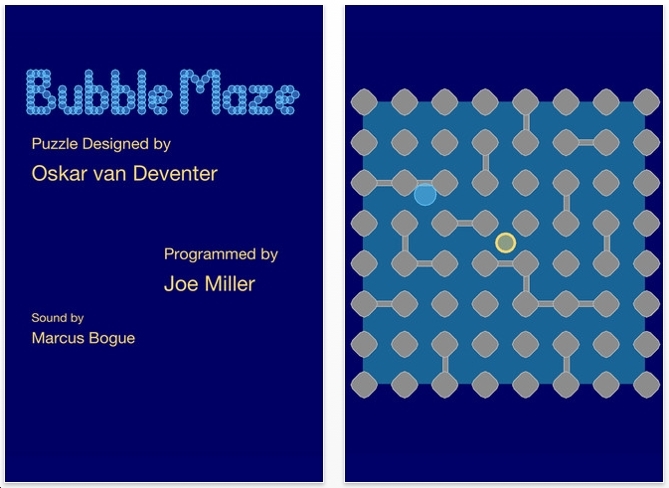 I highly recommend downloading Amazing Cube Maze - another Oskar van Deventer puzzle app. 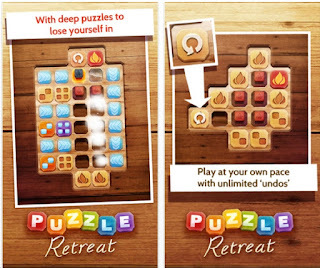 Smartphone is a sliding tile puzzle game. 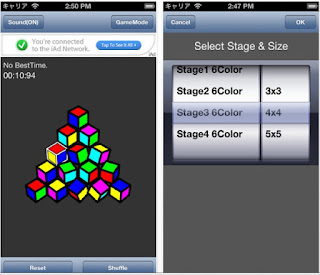 Raf Peters of http://smartgamesandpuzzles.com/inventor/Home.htmlinvented it. In the last 5 years Raf has invented a slew of puzzles! The grid has tiles that are 2 by 1. 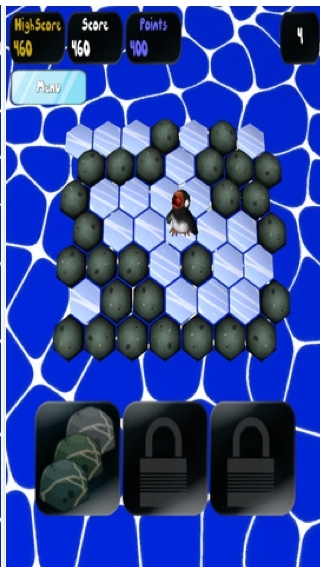 Some of the tiles have circles. The object is to move the tiles around so that the circles hover over the telephone numbers of your friends. 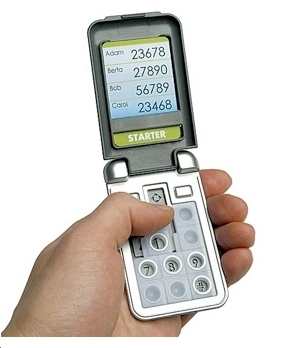 Notice that each friend has only a 5-digit telephone #! There are 32 challenges. I have not done them all. But I have done the 'expert' levels. 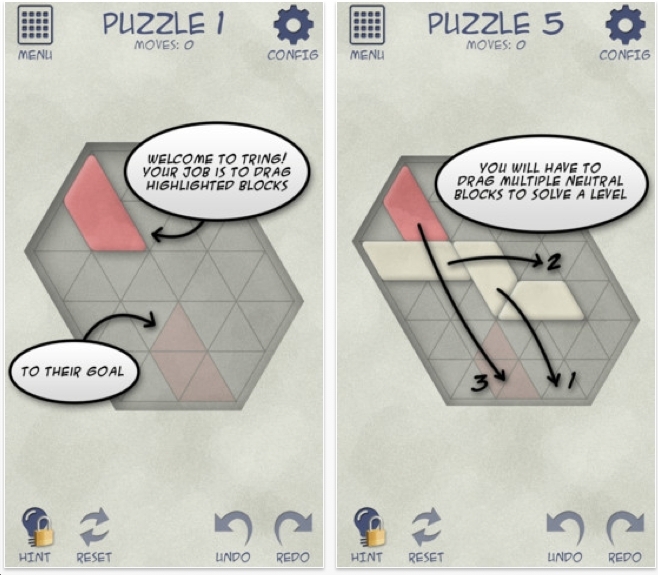 And the solutions can be tricky for a novice puzzler. Smartphone is not easy to find. Check with Puzzle Master to see if they have any in stock. 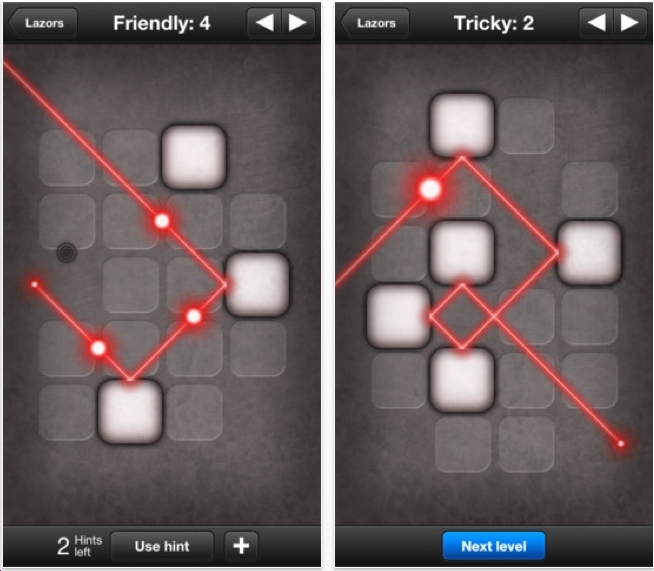 Lazors is a puzzle app game from the the good people at Pyroshere - great company name! 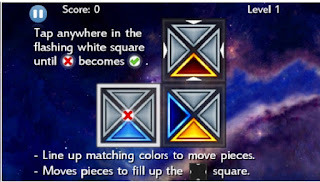 Instead of placing the typical mirrors, you must place white squares on the grid so that the little black circles get hit by a lazor. 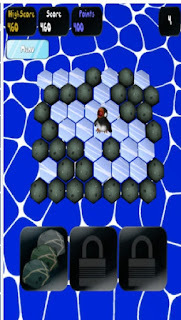 Important: you must place all the tiles on the grid - some will certainly get in the way. 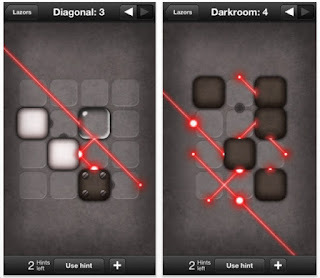 Black squares: they act like black holes - the light will die and not bounce off. The gray tiles act as a doubler: when a ray strikes it, 2 rays will emerge, one bouncing off, and the other passing straight through. 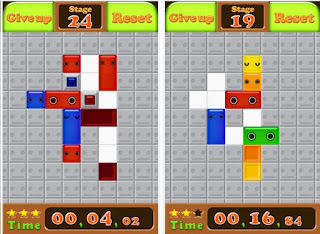 A good set of puzzles will let you bounce around between easy & hard. Lazors does this. Right now I've done about 80 of the levels of varying difficulty. There have been many lazer puzzle app games published......Lazors is refreshingly good. Not that the others are bad. 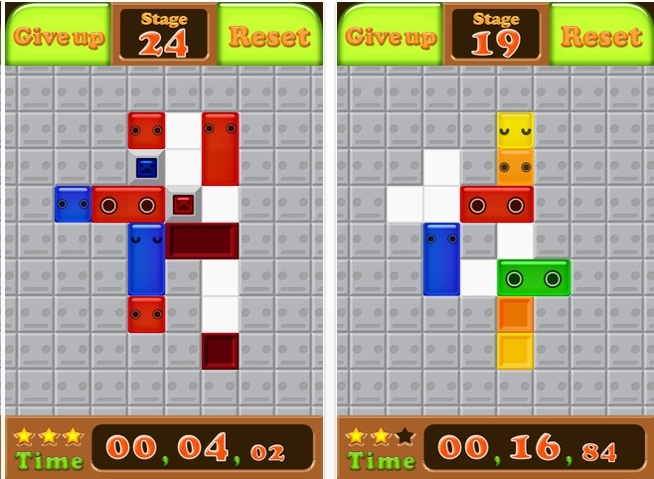 MatCube is a very interesting, difficult sequential movement puzzle. It's similar to Lights Out. 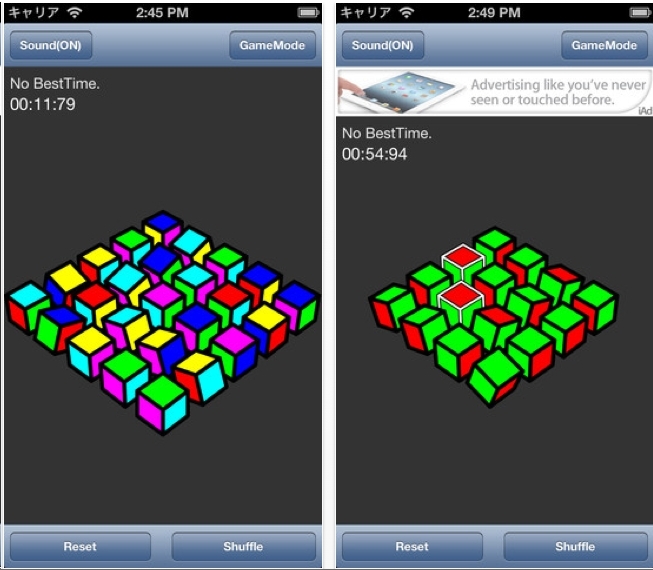 Touch 1 cube and the surrounding cubes rotate. In Lights Out games, the surrounding pieces turn on/off. 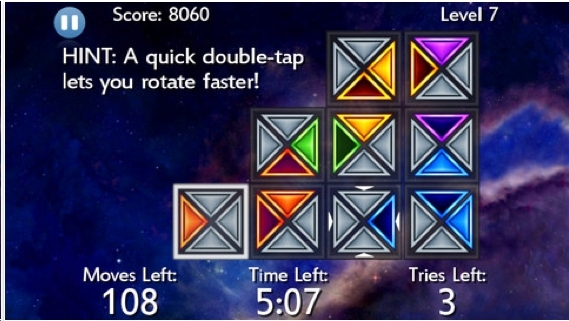 I tried MatCube at the easiest level and got stumped! I was able to get all the top squares to be the same color, but the side squares have to match too. 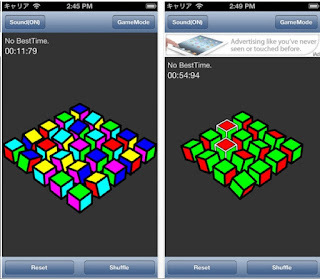 MatCube is a totally free puzzle app game. Let me know how you fare. Nicola Salmoria created Twin Beams, which is a puzzle that I really like. He has also been sending me puzzle recommendations for the past 6 months. Now Nicola has a blog that's very similar to mine. So, go to his site and sign up as a follower. 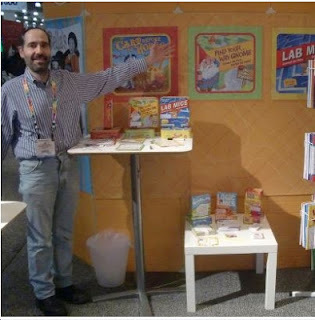 Mindware.com has published 2 of my puzzle games: Lab Mice Puzzles and Find Your Way Gnome. Click here to order them. Below is a very detailed review. Who is Mr. 99? 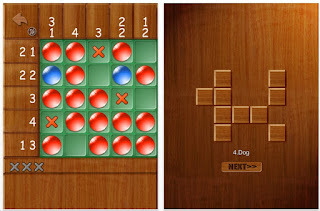 Tring is a new sliding tile puzzle game app that is similar to ThinkFun's Rush Hour. As you can see from the pictures, the pieces are parallelograms and trapezoids and they must slide along a triagular grid system. Jason Fieldman is the brains behind this. I've done about 50 of the puzzles. They are challenging! The best part of this puzzle game app is reading about Jason's trials & tribulations. 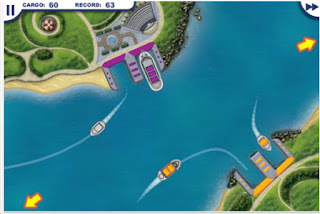 Harbor Master is a puzzle game app where you have to quickly direct purple ships to the purple docks and the yellow ships to the yellow docks without collisions. Think fast & react quickly. 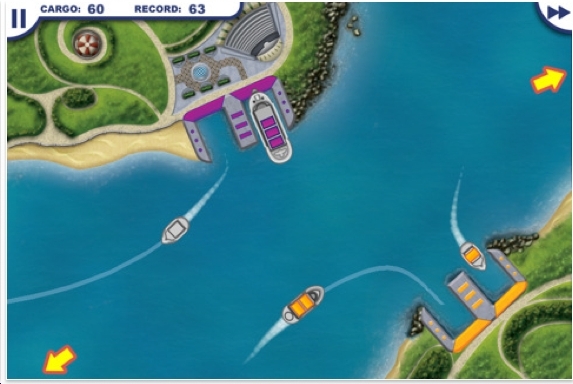 You must also quickly get the ships out of the docks. Lots of people love this game. Not I. Perhaps you will. 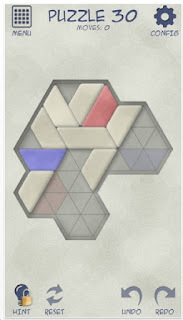 Paul Ripley recently sent me an email about his puzzle app game Hexius. There are 3 modes of play. 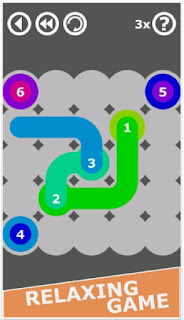 The one I'm interested in is the Strategy Mode where you are given 30 moves and as much time as you want to get the highest possible score. Are you familiar with the Traveling Salesman problem? 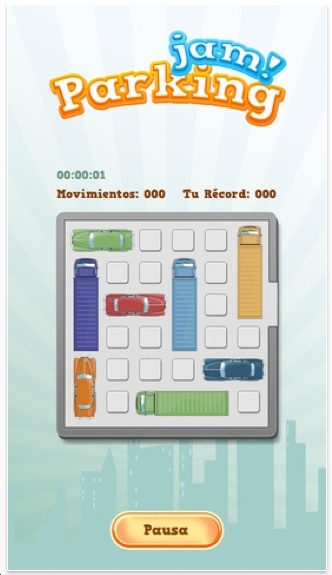 The objective is to minimize the distance for multiple cities. Hexius is the opposite: you want to maximize the distance to score points. But there's more strategy involved which is too difficult to explain. Go to their web page and watch the tutorial. You will also notice that this company made Guide the Light, which I reviewed not too long ago. Side note: The List of Best Puzzle App Games of 2013 will be published December 31. Mark your calendars. 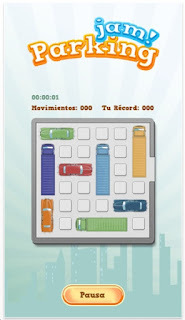 Jelly Fits Puzzle comes from Qmax, Inc in China. 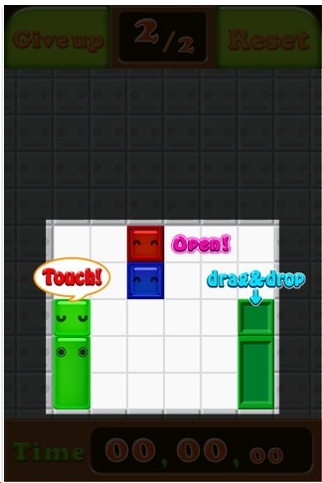 The object is to slide the colored tiles onto their homes. 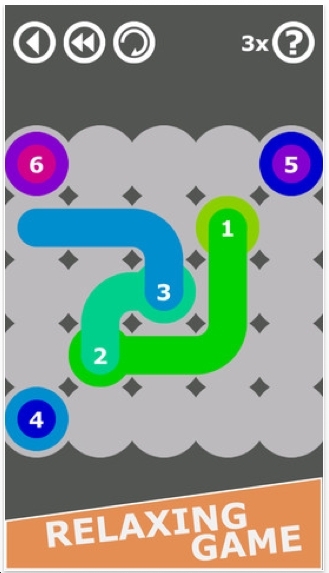 Look at challenge level 24: see the small blue square? When the normal blue square gets to its home (which is covered up temporarily by the long vertical red rectangle), then the small blue square will disappear and turn white. Which means that pieces may travel over it. There are 36 levels. I've done them all. Not terribly hard, but there's potential here. Check out the image of the penguin with a human tongue and uvula. The objective of Pen the Penguin is to surround him so that he cannot get to the edge of the ice island and go for a swim. If that happens, a whale will gobble him. That particular video is worth watching! The penguin takes 1 step, then you get to block 1 step. If you step on a 'supply crate', it can provide you with a choice of 5 things to help keep the penguin sealed in. For example, look at the image. See the 3 rocks grouped together at the bottom of the screen? They can be deployed. 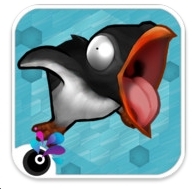 Pen the Penguin will probably not succeed in making it on to the list of best puzzle apps of 2013. But it's cute. The annual New York Puzzle Party Symposium will be Saturday February 9, 2013. If you are interested in attending, contact me. Book Tower has all the rules of Tower of Hanoi, but color is added. 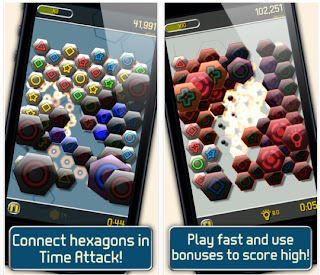 I've seen 3 or 4 versions of this exact same puzzle. I don't remember the names though. 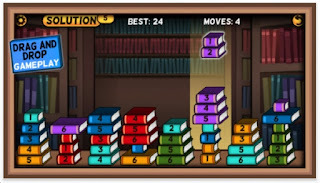 What I particularly like about this version is the theme of books and the library background. They did a nice job on that.